As a celebrated Fitness expert, corporate speaker, brand spokesperson, TV personality, author and philanthropist – Fitz Koehler has done it all! Fitz is a self-proclaimed gym rat who uses her own passion for fitness to help others discover the benefits of living a healthy lifestyle. 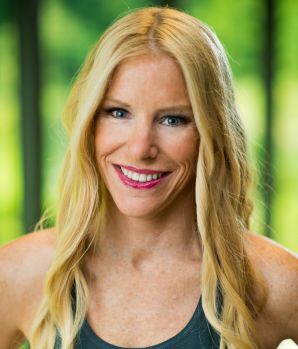 She is the President and CEO of her own fitness company, Fitzness International LLC, which was built around her expertise in the health & fitness space. While earning a Master’s Degree in Exercise and Sport Sciences from the University of Florida, Fitz began writing features for health magazines detailing her experiences as a competitive kickboxer. In 2009, she published her first book, The Everything Flat Belly Cookbook: 300 Quick and Easy Recipes to Help Drop the Belly Fat and Tone Your Abs. Fitz own training methods for a healthier lifestyle. Her signature brand of fitness education for children and adults has now been shared with millions of fitness enthusiasts via mass media in traditional formats including TV and radio features in addition to her active social media platforms. Over the course of her career, Fitz has appeared as a fitness expert on major TV programs and talk shows on ABC, FOX, CBS and NBC. In 2013, Fitz released her own core training DVD called Flip Flop Abs which has helped fitness enthusiasts of all levels develop lean, strong core muscles. That same year, she received the Community Leader Award presented by President Obama’s Council on Fitness, Sports and Nutrition. As a corporate spokesperson and celebrity brand ambassador, Fitz insists on representing products she truly endorses and feels comfortable recommending to her many fitness followers. She has turned away millions of dollars in endorsement deals because she doesn’t believe in lab-grown shortcuts to effective fitness. Fitz believes in wise choices, consistency and fun, the three pillars that have become the source of her own success. In the past, Fitz has worked with industry leading brands such as Disney, Office Depot, Oakley, Tropicana and Everlast. Fitz’s work with celebrities includes endless amounts of notable Hollywood personalities including Brooke Shields, Christina Applegate and Vanessa Williams. Her global reputation as a fitness expert has also led to a variety of opportunities as a passionate motivational speaker for health & fitness conferences, corporate events and university forums. She is also actively involved with her alma mater, serving as a Leadership Council member for the University of Florida’s Diabetes Institute. In her effort to “change the face of the next generation and win the battle against childhood obesity”, Fitz founded The Morning Mile, which is a before-school running/walking program. Successfully implemented in approximately 200 schools throughout the USA, Canada and Japan, Fitz’s Morning Milers have run over 1.5 million miles since the program’s inception in 2010. She’s both bold and successful in her personal mission statement to make a mass impact in health and fitness.